Mail4Rosey: MailPix Review and Photo Ornament Giveaway! There's a new photo company in town! When it comes time to print holiday (or any!) photographs you want to make sure the products you end up with are high quality. We just received our first order from Mailpix, and the work was really nice! MailPix takes the latest user-friendly web technology and integrates it with social media options, making it a snap to turn digital, Facebook, and Instagram pictures into hard copy prints or photo products. 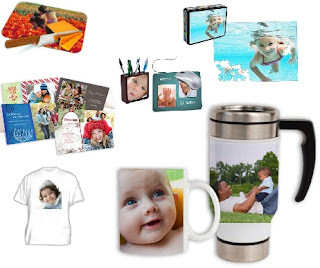 With a large assortments of photo projects that are perfect for gift giving too, you'll want to check out their website. They have custom photo holiday ornaments, greeting cards for every occasion, canvas wall art, pillow cases (how cool would it be to have a child's favorite picture put on a pillow case?!?! ), photo cutting boards (glass); photo coasters (a unique and awesome gift idea that will be used year round! ), tote bags, and more! I've purchased a photo item for 'grandma' (actually my mom, but the kids call her grandma...and she likes it ;) ), my husband's boss, and a good friend of mine (all of those products customized with a photo I know the recipients are going to love). I am contemplating ordering personalized photo totes for the three children of close friends of ours too (I think that'd be a really fun gift item for them to open because they all love packing and toting their things around). We order a lot of photos in this house, so the first thing I selected when I ordered was 4x6 photo prints. I am happy to say that they came back very clear, vibrant in color, and the paper they were printed on was a nice quality too. I also ordered some 5x7's (they are on sale for $.25 a piece right now! ), just to see how they would turn out, and they were sharp! No detail was lost. Right now Mailpix has this deal going on: 100 4x6 prints free to all new members. can get 100 4x6 prints for $1.00! My favorite thing about Mailpix, I have to say, was the editing services that they offered. I really dislike when something important gets cropped out of a photo I'm ordering because it's a digital version. With Mailpix, every photo you have selected (that is in your cart) pops up at check out and you then have a chance to move it around if something is getting cropped out that you want to keep. I love that option! There are also two photo editing services offered, Aviary and PicMonkey, for every picture you order, if you want to use it. I played around with the editing services a bit (click on the magnifying glass on the picture you've selected, and then on the pencil, to edit), and tested the 'effects,' 'the black & white,' the 'warmth,' 'sharpness,' and 'enhance' modes (LOVE the enhance mode for fixing those pictures that are just a bit 'off,'). I also played around with the stickers option (too funny! ), and the blemish option. Everything worked great, and my altered photos were fun to make. MailPix has a LOT of greeting card options! I also ordered one holiday photo card to test it out, a handful of folded 5x7 photo Christmas cards (they have a lot of options for design here! ), and a customized ball ornament for our Christmas tree. Because I just ordered a couple of days ago, the only thing that has arrived is the photographs (super fast delivery time!). The holidays are fast approaching though, and Mailpix has graciously agreed to give one customized photo ball ornament to a lucky Mail4Rosey reader...so I'm going to go ahead and post the giveaway so you can get your ornament in time (to either gift it, or to enjoy it for the holidays!!). ONE WINNER WILL RECEIVE THEIR OWN CUSTOMIZED PHOTO BALL ORNAMENT! Keep in mind too, that MailPix has a good number of deals going on at any given moment. Right now you can get an 8 1/2 x 11 customized photo wall calendar for $9.00; a 15 oz. photo mug for $8.00; reusable grocery bags with your photo or photos of choice, for $2.00; and 50% off of all holiday cards...to name but a few. AND every new member (it's free and easy to sign up) will get 100 free prints. Take a look around the website, I think you'll really like what you see! I know our family liked the service, and we will be using it again. The giveaway below is going to be short and sweet to ensure you receive and get to enjoy your ornament for the holidays. Please use the Rafflecopter form below, and be sure to spread the word about this new company. If you would like to know more about Mailpix, you can take a look around their website. You can also follow them on Facebook, Twitter, and/or Pinterest; and you can take a look at their blog (they also have an assortment of 'how to' videos on YouTube). Winner will be randomly selected by Rafflecopter, and have 24 hours to get back to me with their information (so keep on your toes checking your e-mail because you might be the one who is the lucky winner!). Thank you MailPix for the great giveaway! I visited MailPix and I like the Personalized Fleece Blanket. I love the Fleece Blankets! The ornament is cute. What a great idea. I like the photo canvas'. I loved that the ornaments could be personalized! Great presents for the grandparents!!! I learned that they are giving away free photo cards, with customers paying only for shipping. Great deal! I really like their canvases! I like the filigree ornament. MailPix is awesome! The quality of the products I received from them was beyond my expectations. I am also impressed with the fabulous deals they have on their prints. By far the cheapest shipped I have found over any other by mail photo company! The personalized fleece blanket is neat! Especially this time of year with the snow and everything...I'd love to have one to cuddle up next to my fire place with. I love the Filigree Ornament! I didn't know you could do all that with pictures. I like the Keepsake Box. The photo books are nice! they also have super cute photo cards! I like the Fleece Blankets. I learned that you can get 5 free 5x7s by Dec 31st! I learned that you can get 100 free 4x6 when you join. I like the fleece blanket! I really like the personalized apron! Glossy photo pages; matte date pages for writing. The fleece blanket.. I have a pic in mind!